What give to people that we love for Christmas? What unusual telling Christmas gift make for friend or collegue? Our team of professional photographers can suggest you great christmas gift idea - individual impressive congratulation for Christmas or New Year - Memorable sign on the sand. Gifts for New Year serve to bring happiness and warmness of giver. Created by your sketch this sign will bring lots of positive emotions and will be please its owner long time. Give impressive gifts with SandSign! Sometimes it's very important to say kind words by impressive, effective way. Now you can impress your new year congratulations and christmas wishes in the most beautiful places of the planet and make such a pleasant christmas gift to your friend or your soulmate. Let's surprise people in your life by interesting gift for Christmas. It's beautiful and creative way to write tender declaration, to make memorable christmas gift for him or for her on halfway around the world! How to greet a collegaue or a boss on Christmas or New Year? Send your wishes around the world. You can create any effective text. Because it's exclusive christmas gift! This christmas surprise will be in memory for a long time, it looks fairily. You will get beautiful qualitative pictures, fascinating christmas gift video. 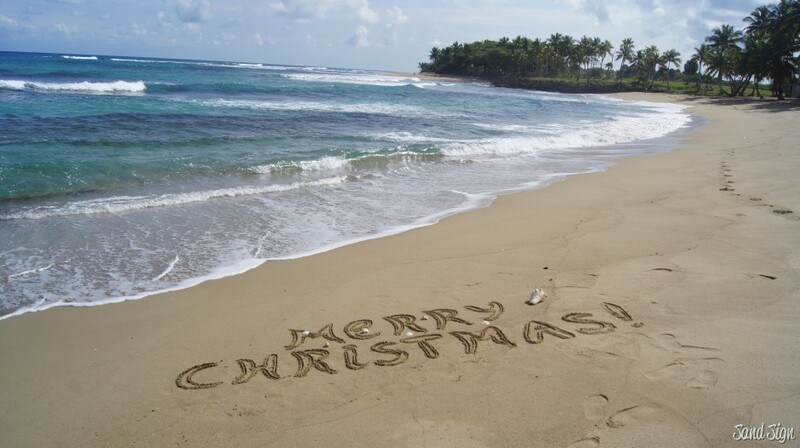 You can decorate your christmas or new year greeting on the sand with flowers or add seashells as well. We garantee high quality of acting! It will be the best christmas gift! Wish you all the best for the festive season!